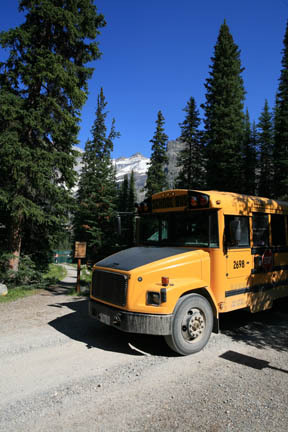 The Lake O’Hara bus schedule for 2019 is similar to previous years. Buses for day visitors depart the parking lot between Lake Louise and Field between mid-June and early October at 8:30 a.m. and 10:30 a.m., returning at 2:30 p.m., 4:30 p.m., and 6:30 p.m.
To book a seat for the 2019 Lake O’Hara hiking season, reserve online through the Parks Canada reservation service from 23 April at 8am MST onwards. This has been new since 2015; previously, reservations were taken by phone up to three months in advance. You can be assured that seats will fill up very quickly on the day reservations open, so plan ahead and get online on 23 April at exactly 8am to ensure yourself a seat on the bus. The process for booking campsites at Lake O’Hara is different from Day Trips explained above. Overnight visitors to Lake O’Hara should call the dedicated reservations line (250/343-6433) up to three months in advance of your planned departure date. Campsite reservations include a seat on the bus, so if you are planning on camping you do not need to make bus reservations separately. As numbers are limited and camping at Lake O’Hara is extremely popular, you will need to call exactly three months prior to be assured of a seat; even then, you should call as early in the day as possible. Phone lines are open 8 a.m. to 4 p.m. Monday to Friday April to May and 8 a.m. to 4 p.m., daily June to September. To help campers understand when you should make reservations, here are two examples: To camp at Lake O’Hara on 24 July 2019, you should call on April 24 2019. To camp at Lake O’Hara during the peak of larch colour on 25 September 2019, you should call on June 25 2019. And it can’t be stressed enough, you should start calling three months in advance exactly when phone lines open at 8 a.m. and expect to spend up to two hours redialling before you get through. Like for day trippers, reservations are only required for the inbound shuttle; outgoing buses fill on demand.